I'm thinking this might end up being a function request for a SL2 upgrade but is there a way short of purchasing a custom skin, to make the notes tab reveal/hide based on a user selected trigger? I don't quite understand what you're looking to do. What kind of user selected trigger do you want? I don't think the notes tab can be hidden and revealed in the way you are referring to. I think I remember the Captivate menu and notes working that way. Does having the notes as a button not work for your needs of reveal/hide? Wendy... what am I looking at? I'm not sure what you are trying to show me. I know i can add that tab in on the left, but what I would like to have happen is to have that tab controlled by a trigger on the slide to be visible / not visible based on the user. Hi Ari, you can't do what you are asking. The best you can do is place the notes tab at the top of the player. When you do this it is closed until the user clicks on it. The issues with this method are that the notes open on top of the content and only stay open while on the slide they are viewing. When you go to the next slide they are closed again. Yep, that is what I thought. Sadly i remember this being an option in either SL1 or Studio. Hopefully enough people submit this as a feature request that it might just return. 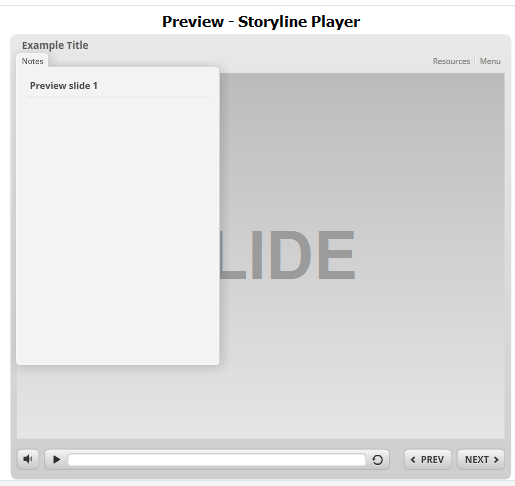 I'm sorry that the ideas here didn't work for you, and I can't remember it being an option in Storyline 1, but perhaps Studio '09 or Presenter 6? You can always share thoughts on feature requests here as well! Thanks Ashley, I'm thinking it was a studio feature. I think I've already put that in as a feature request a while back. "Hi Ari, you can't do what you are asking. The best you can do is pl..."
In Storyline can you globally change the font in Notes tabs only?